Step 1: Sign up to get in fast & FREE, with free drinks for Ladies. Step 2: Receive a confirmation email shortly after and each day of event. Step 3: Club stress free, with no gimmicks & no hidden fees! VEGAS’ MOST TRUSTED NIGHTLIFE COMPANY! LasVegasGuestList is your free connection to the most unforgettable party destination on earth: Sin City! We work with the best Nightclubs, Pool Parties & Strip Clubs! Offering free Vegas club passes and easy access. Just use our signup form above and you will receive an instant confirmation email & text confirmations for each event! Our priority is your good time and our 1100 Testimonials prove it! LasVegasGuestList is famous for customer service. See over over 1100 positive reviews of our service here plus hundreds more on Yelp and TripAdvisor! And it’s free! Check out our 5 Star Yelp Reviews! Check out the free clubs in Vegas we offer. Sound too good to be true? It’s not! We’ve been Las Vegas’ most trusted Club Promoters for over 7 years! You’ll enjoy everything the legendary Las Vegas nightlife scene has to offer, stress free with our Vegas VIP passes!Get your free VIP entry today! 5 stars for sure. Went for the weekend with my boyfriend, and we were able to get in to 3 parties for free. Simply amazing. Just got into marshmello concert at the xs encore for free with my sister. Have you ever heard about something that deserves 5 stars more than that? They provided us with a free guest pass to Rio in las Vegas at VooDoo lounge. It was a great experience at the 51st floor, would definitely recommend. This is the best service ever. Had some friends in town over the weekend. We went to see TI at Drais and Ludacris at Daylight Beach Club, best part it was free! We had a great time! we didn't have to wait for more then 10 minutes at the door and the club was amazing! Las Vegas club promoter gives inside look of the industry. For the past seven years, Team Hornak has worked as a nightclub promoter at clubs such as Marquee at The Cosmopolitan of Las Vegas & Ghostbar at Palms. 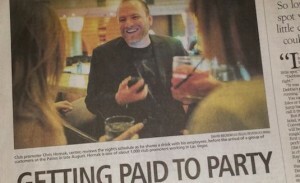 More like an entertainment concierge, people seek Hornak out to organize Vegas club passes and outings at pool parties, nightclubs and strip clubs depending on his clients’ requests. Check out our Events Calendar for what’s happening in Vegas!